Fall is here and the holidays are fast approaching! What a nice time to start thinging about holiday food and fun. 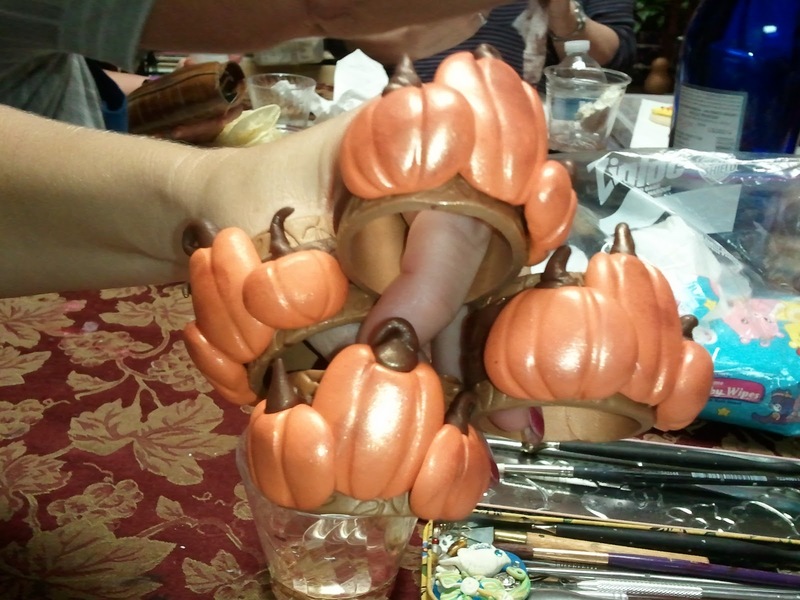 If you are an entertainer then you might like the tutorial here on Pumpkin Napkin Rings. I will have NO TIME for entertaining or blogs for a while...since I am devoting my spare time these days gearing up for the big SHOW! You are all invited...it will be an awesome event with so many wonderful artists and crafters and just in time for those last minute gifts for Christmas. The Atomic Holiday Bazaar in Sarasota, Florida will be held on December 10 and 11, 2011. It's been so much fun! I'm creating INVENTORY! Wow...I am so used to making one of something and then trying something else! 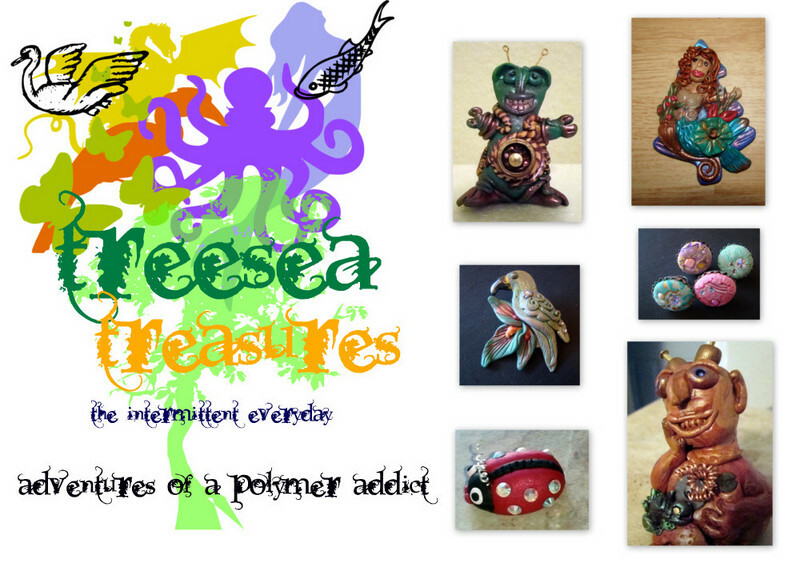 Thinking about a collection of items that represents me has been tough and time consuming! In the midst of that, I've also had some requests for customized bottle stoppers and bottle openers...when they are finished I promise to post! 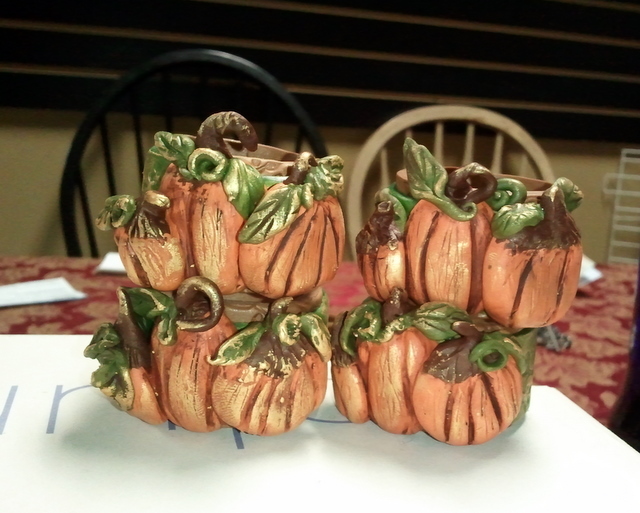 This week, I had a great time teaching a Pumpkin Napkin Ring class at the Laughing Ladies. 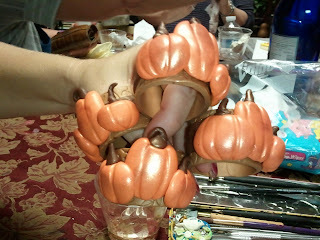 Cathy is awesome to allow me to use her shop Laughing Ladies to play with clay! 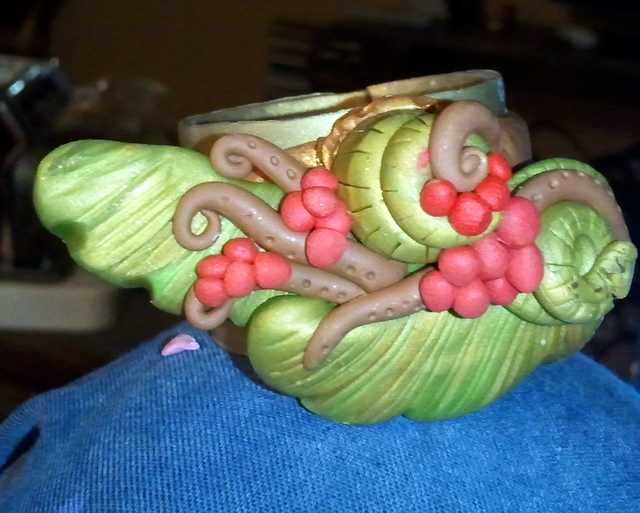 She has several friends, who wanted napkin rings for the holidays so I came up with something and we had a blast! Food, wine, cookies...what...no CHOCOLATE??? Oh...did somebody mention clay! We had a LOT of clay! Here are my examples for the class: Don't know how I came up with this, but I certainly had pumpkins running through my brain. Don't know what that little blob is there...but the whirly gig is kind cute, huh???? I experimented a while and discovered that the trick to success is baking the basic ring first, then adding a second layer, making sure that the seams are never lined up...this will add stability to your ring and prevent then seams from popping apart. 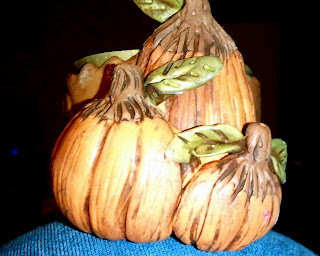 Make sure you bake long enough for the added thickness of the pumpkin! I use Premo clay and bake twice, at least 45 minutes each time. Have fun! Hope you can see the pics good enough to get the idea. 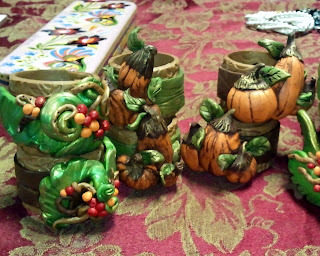 Here are some beautiful napkin rings made by Paulette, Claudia, Cathy, Deb and Marinda! You ladies are awesome and I had such a great time! Thanks for sharing the evening with me and Pat! You are awesome, friend. I couldn't have done it without you! Well, maybe I could, but we would all still be there putting stems on pumpkins...and pumpkins and pumpkins!